We’re all waiting for the new Last Jedi trailer to drop tonight, but here’s something fun and unexpected to admire as well. It’s the first teaser for the animated version of “Shada,” the legendary Douglas Adams-penned Doctor Who serial that never made it to the screen, thanks to a BBC strike in the late 1970s. “Shada” may not have been completed, but it’s never been forgotten. There’ve been a few different iterations over the years, including most recently a surprisingly entertaining book, Doctor Who: Shada: The Lost Adventure, by author Gareth Roberts. This new teaser for the animated version gives you a very short but intriguing look at the finished product, which will combine remastered versions of the original scenes with animated recreations of the unfilmed scenes. 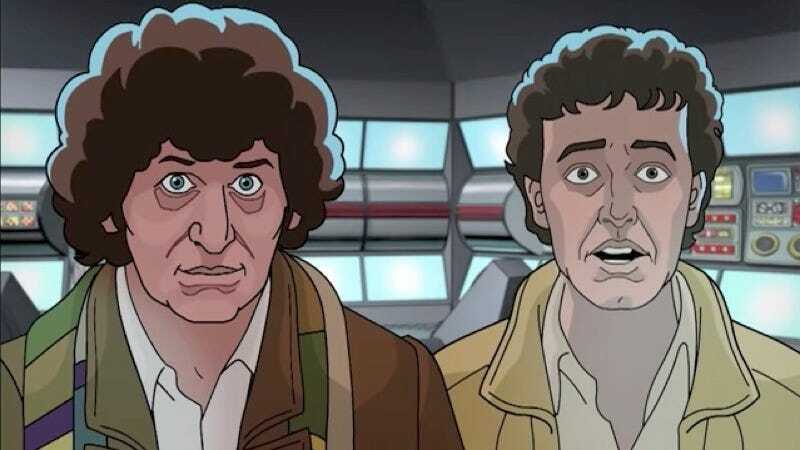 The original actors, including Tom Baker, will return to voice their cartoon counterparts. The official Doctor Who Twitter shared this artwork, and tons more details at the linked story, including the news that “Shada” will be out on digital download courtesy of BBC Worldwide on November 24, then on Blu-ray and DVD on December 4.